View the Online Scientific Program to see all sessions and abstracts accepted for the joint AGU-CAS JING Meeting. Wi-Fi will cover all conference rooms. 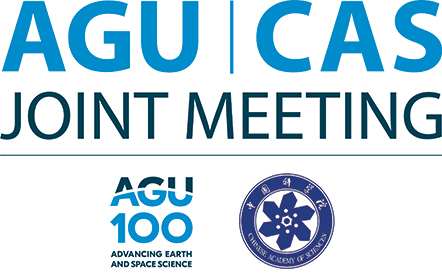 All presenters MUST be registered to attend the AGU-CAS JING Meeting. Note that registered guests are not allowed in the poster hall; guest are not allowed in the scientific sessions. Only registered scientific attendees may enter the poster hall. Please have your meeting badge visible for the security guards at the entrance to the hall. Please check the online scientific program for any updates closer to the meeting. Tuesday, 16 October: 3:30 P.M. – 7:00 P.M.
Wednesday 17 October – Saturday 20 October: 7:00 A.M. – 6:00 P.M.
Check-in: All speakers are required to check into the on-site Speaker Ready Room at least 24 hours before their presentation. Please check the online scientific program for any updates to the program. Presentations should be reviewed in the Speaker Ready Room to be certain the fonts are displayed correctly. If you cannot upload your presentation 24 hours before your session THAT IS OK. Please go to the Speaker Ready Room as early as possible before the start of your session. Checking in at the Speaker Ready Room on-site is the most important step you will take to ensure your presentation is a success. Those presenting on Wednesday, 17 October must check in Tuesday, 16 October between 6:00 M. and 9:00 P.M. We strongly suggest that presenters scheduled for Wednesday, 17, check-in to the Speaker Ready Room as soon as possible before the start of your session. The file will then be transferred to the computer network at the AJM2018 meeting. When the presentation is to be given, the file will be loaded on the computer in the oral session room. Once the presentation has started, the speaker will control the program using a computer mouse. You will be required to provide identification to submit your presentation and also to access it in the Speaker Ready Room; presentation media is returned to the speaker. USB ports and CD/DVD drives on computers are disabled so no presentations can be copied, and external storage devices will not function on the meeting room computers.Cameras and video equipment are not permitted in the Speaker Ready Room. Oral session presenters may visit the Speaker Ready Room, located in Room (TBD) each day to familiarize themselves with the equipment in the room or ask a technician any questions. Be considerate of other speakers and the audience by staying within your allotted time. The individual presentation time includes 5 minutes for discussion and changeover to the next speaker. Session moderators will hold you to the allotted time, which is essential to ensure adequate time for questions and discussion. Use the microphone and speak toward the audience. Note: When the microphone is clipped to your lapel, it is difficult for the audience to hear if you turn your head away, so please have copies of your presentation at the podium.